A few years ago when I was visiting Manila, one of the most memorable dishes I tried was a traditional Filipino peanut stew called Kare-Kare with bagoong. Having little experience cooking Filipino food, I went to the wonderful Astig Vegan and adapted her Kare-Kare recipe and used her delectably salty-fermented vegan bagoong. 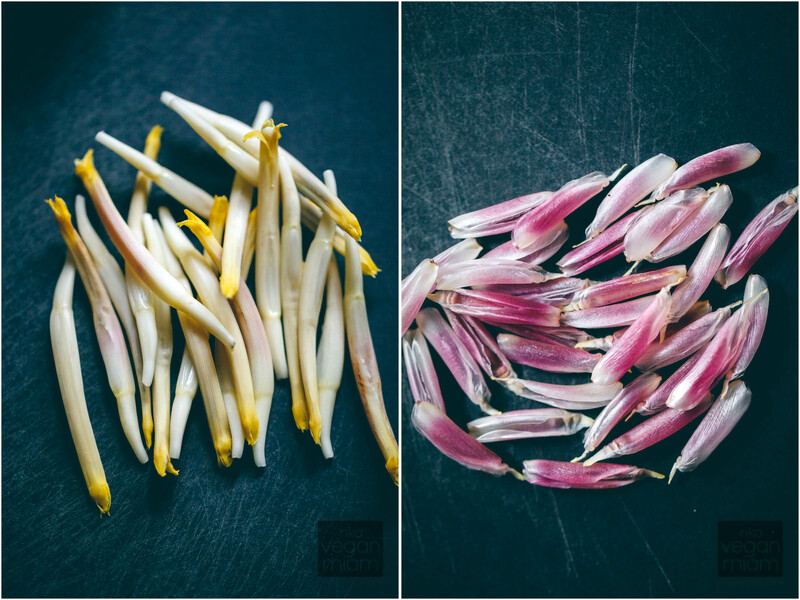 One of the unique ingredients in this dish that I was excited to work with for the first time was banana blossom. 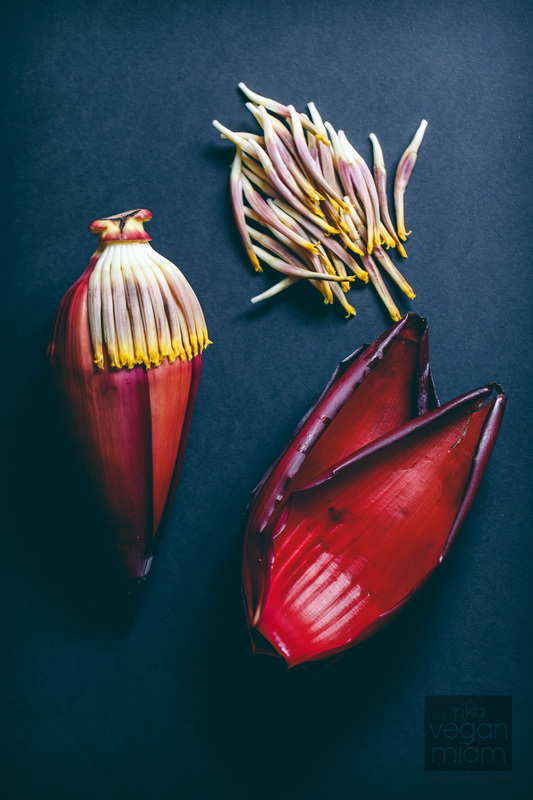 I’ve tried banana blossom on a few occasions during my travels in South-East Asia, it’s a common ingredient in this part of the world (especially in curries), but I had never worked with it in my kitchen before. 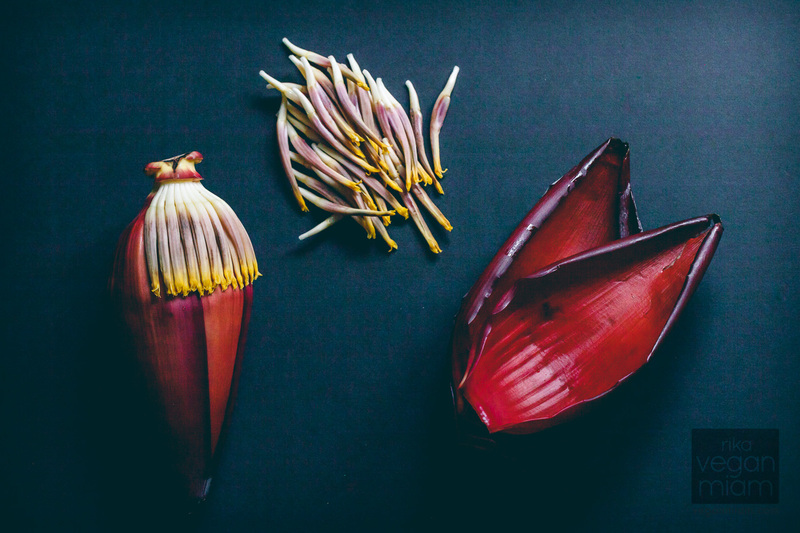 Common in South-East Asian cuisine, banana blossoms (aka banana flower or banana heart) are tear-shaped maroon or purplish flowers hanging at the end of banana clusters. They can be eaten raw or cooked and are used primarily in salads, curries or soups. 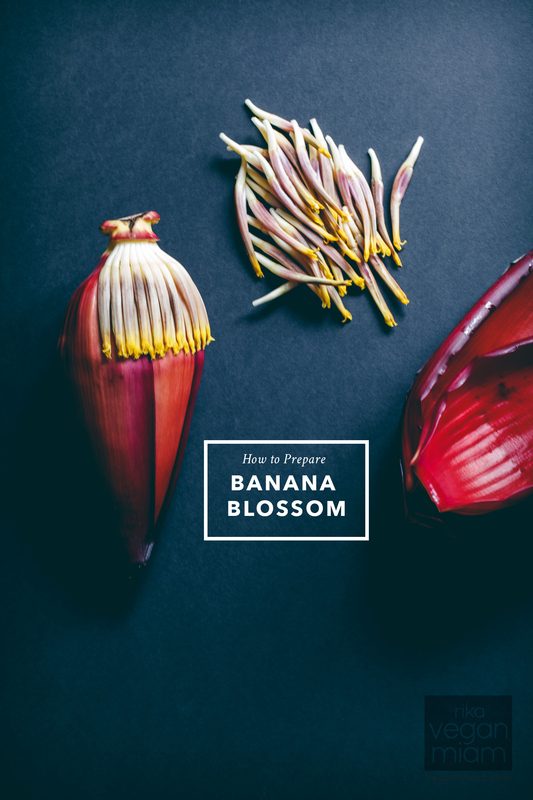 Fresh banana blossoms are available at most Asian groceries. There is also a canned version since it is not a common ingredient in the U.S. Note: I found fresh banana blossoms at an Asian grocery in SE Portland (Oregon). 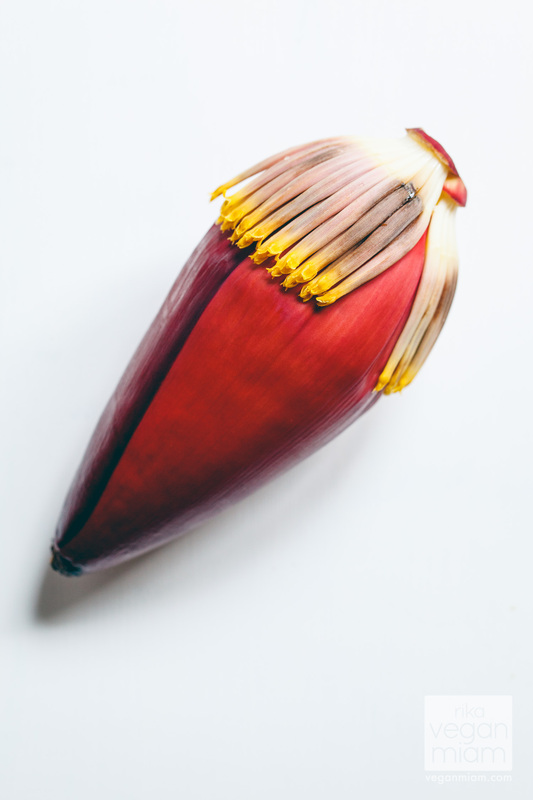 When choosing a banana blossom, select a firm one with tightly packed petals and they should be a purple-red. There should be no signs of decay. 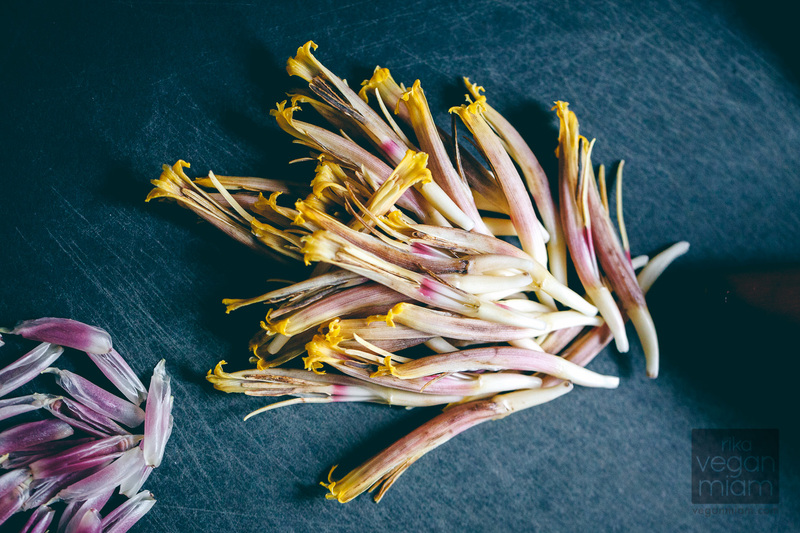 If not using, wrap it in a cling film or plastic wrap to keep the petals closed completely and store it in the refrigerator. The tough reddish leaves on the exterior are known as bracts. These can be used as serving plates or otherwise discarded. Beneath these ‘bracts’ leaves a row of delicate yellow-tipped florets that can be removed and immediately soaked in acidic water to avoid discoloration and bitterness. 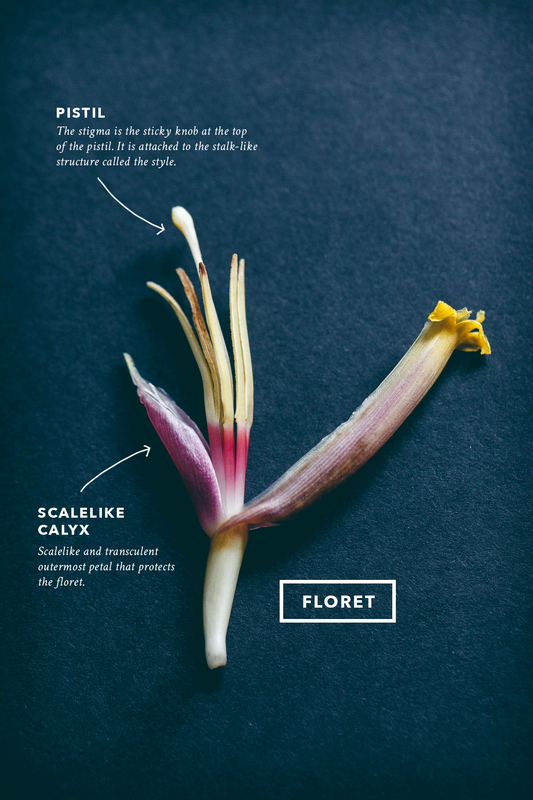 The colorful florets are eventually ‘soon to be bananas’ and are part of a tedious cleaning process: pluck the matchstick-shaped pistil (tough and not pleasant to consume) and the scale-like outermost petal (aka calyx). You have to do this for every floret. Discard them and soak cleaned florets in acidic water immediately for several hours or overnight to prevent browning and remove the bitterness. Rinse in cold water, drain and squeeze out excess water. Regarding the taste, these florets (if not soaked in acidic or salted water) will leave a bitterness on your tongue if eaten raw (or if you are just curious). Once they are soaked & rinsed for awhile and cooked, they won’t be as quite bitter, yet tender. They are commonly used in Southern Indian cuisine such as fritters, stir-fries or fried dishes. I haven’t used the florets yet. The intermediary leaves, that will be pale pinkish in color, are edible and tender. As you peel away the dark bracts you will reach a white or pale-colored heart once the leaves become too small to peel. Trim the conical stem and discard. Once sliced in half lengthwise, it will produce a sticky white sap. Immerse it immediately in acidic water and let sit for two hours to remove the bitter sap and avoid browning. 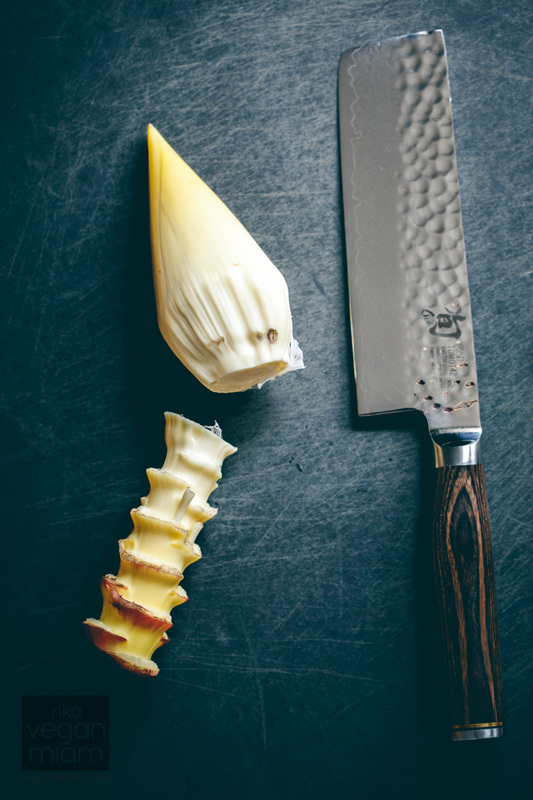 Pictured below is one of our favorite Japanese kitchen knives – cuts incredibly well especially through toughest ingredients and perfect for slicing vegetables and fruits paper-thin: Shun Nakiri Knife. 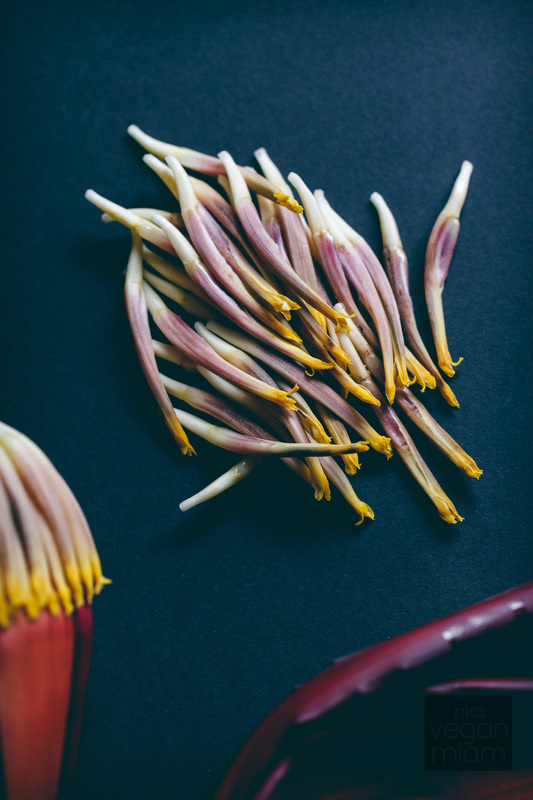 I read that banana blossoms are difficult to clean due to the black sap – to avoid these stains, use any neutral oil and rub it all over your hands before handling the blossom. 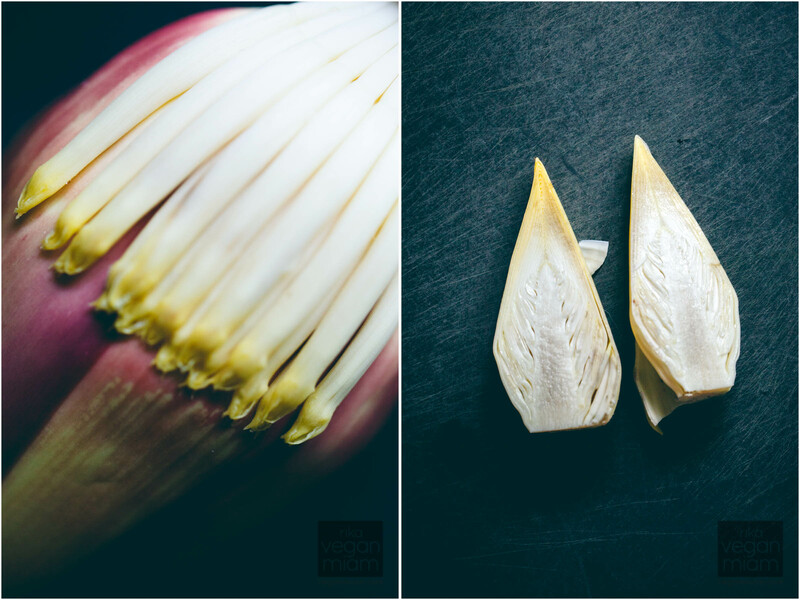 I used an old cutting board and a bit of oil on my finger tips to make the cleanup a little easier; however, in my experience the blossom wasn’t that messy. Top: Not yet cleaned yellow-tipped florets. Pluck the matchstick-shaped pistil and the scale-like outermost petal (aka calyx). Top, from left: Cleaned florets without the pistil and calyx; scale-like outermost petal (aka calyx) to be discarded. Top: Discarded pistils. The stigma is the sticky knob at the top of the pistil. It is attached to the matchstick-shaped structure called the style. 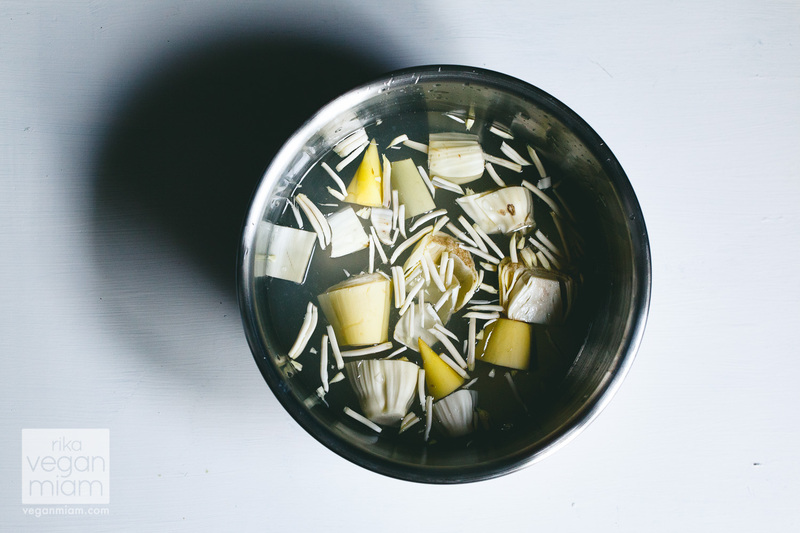 Fill a large bowl with cold water and salt, juice or vinegar. 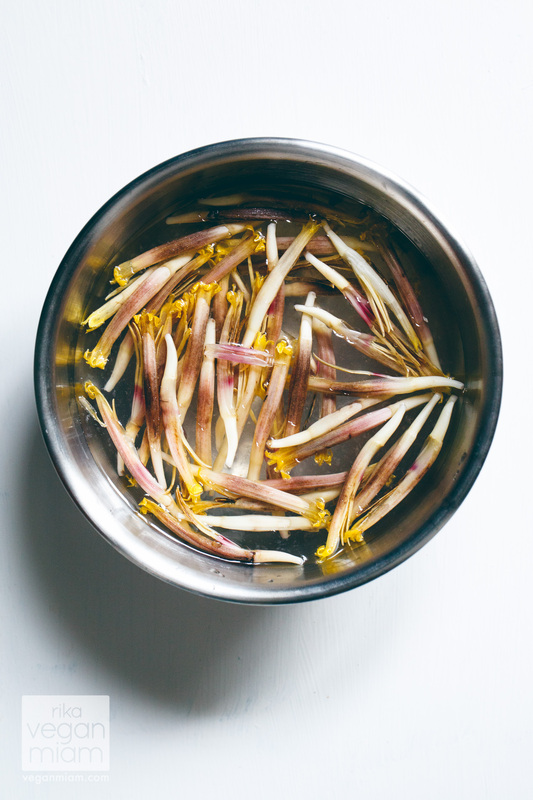 This will be your ‘acidic water.’ Use any neutral oil and rub it all over your hands before handling the blossom. Prepare it on an old cutting board or newspaper to make the cleanup a little easier. Remove the tough reddish leaves (bracts) and florets one by one. These bracts can be used as serving plates or otherwise discarded. Beneath these ‘bracts’ leaves a row of delicate yellow-tipped florets that can be removed and immediately soaked in acidic water to avoid discoloration and bitterness. The intermediary leaves, that will be pale pinkish in color, are edible and tender. As you peel away the dark bracts you will reach a white or pale-colored heart once the leaves become too small to peel. Trim off the conical stem and discard. Once sliced in half lengthwise, it will produce a sticky white sap, chop them up in any sizes. Massage and immerse them in acidic water for several minutes and let sit for two hours to remove the bitter sap and avoid browning. Drain in a fine-mesh strainer and rinse in cold water before using. Fill another large bowl with cold water and salt, juice or vinegar. 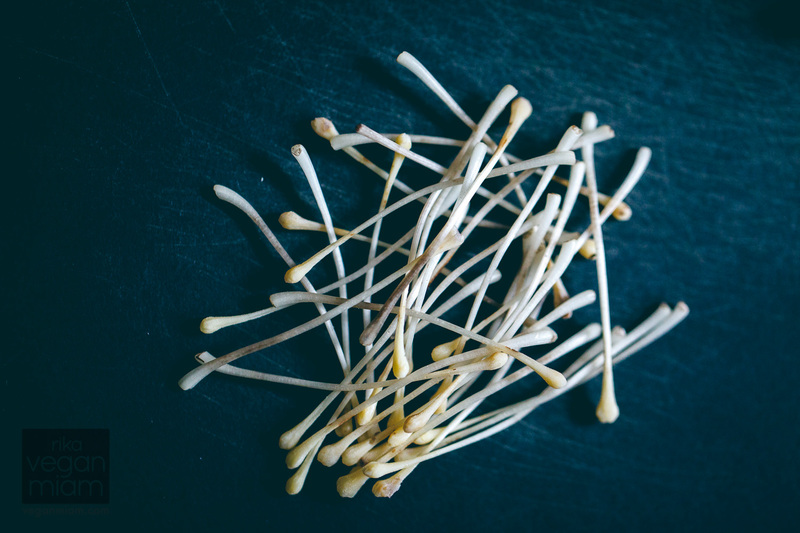 The florets are part of a tedious cleaning process: pluck the matchstick-shaped pistil (tough and not pleasant to consume) and the scale-like outermost petal (aka calyx). 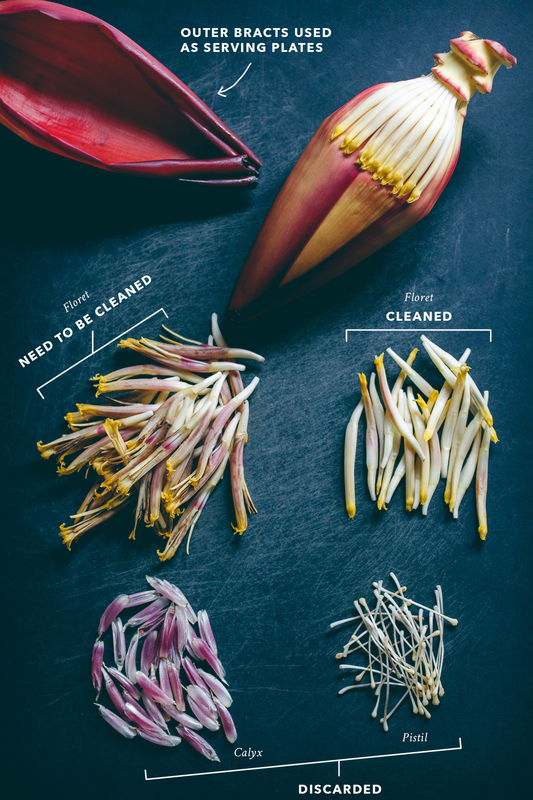 Discard them, soak cleaned florets in acidic water immediately and soak for several hours or overnight before using. 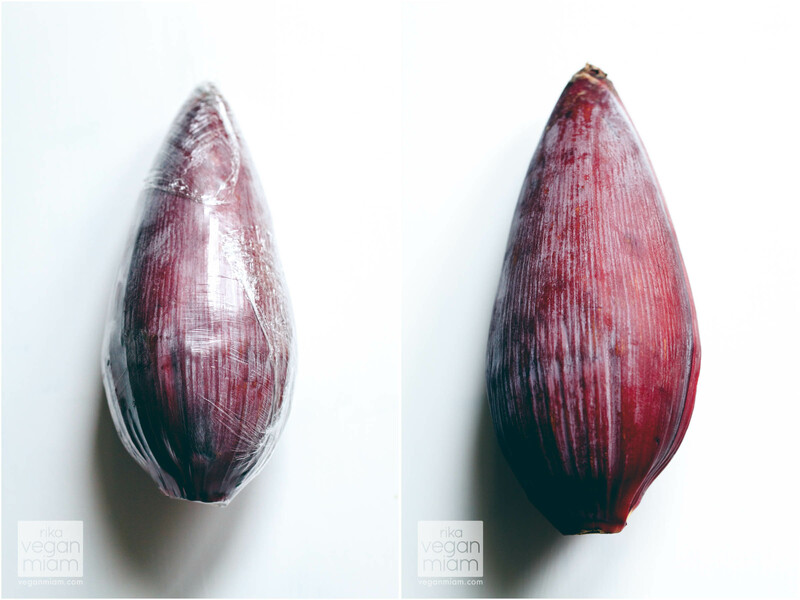 Rinse them in cold water and squeeze out excess water. View floret diagram. 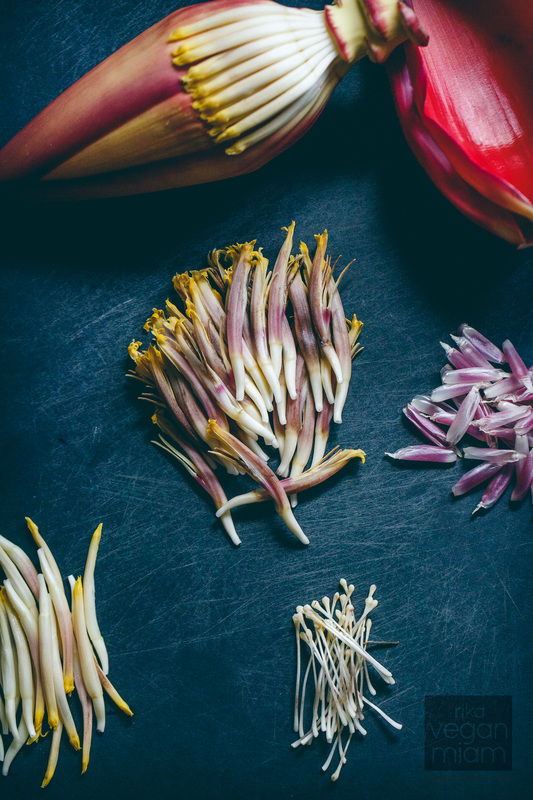 Have you ever tried or cooked with banana blossom?